All about growth spurts. How to hand a growth spurt with your baby’s schedule, when to expect growth spurts to happen, and how growth spurts work. 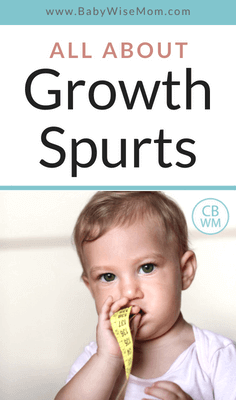 Growth spurts are something that seem to cause a lot of problems for moms who follow a schedule. Some are afraid to feed more often and start a new habit. Some feed more often but don’t know when to stop or are afraid to stop. Growth spurts seem to be quite mysterious. Here is what Tracy Hogg has to say about the growth spurt in Secrets of a Baby Whisperer (found on page 116). Growth spurts seem to be more of a “problem” for breastfeeding moms than bottlefeeding moms, but both have problems. 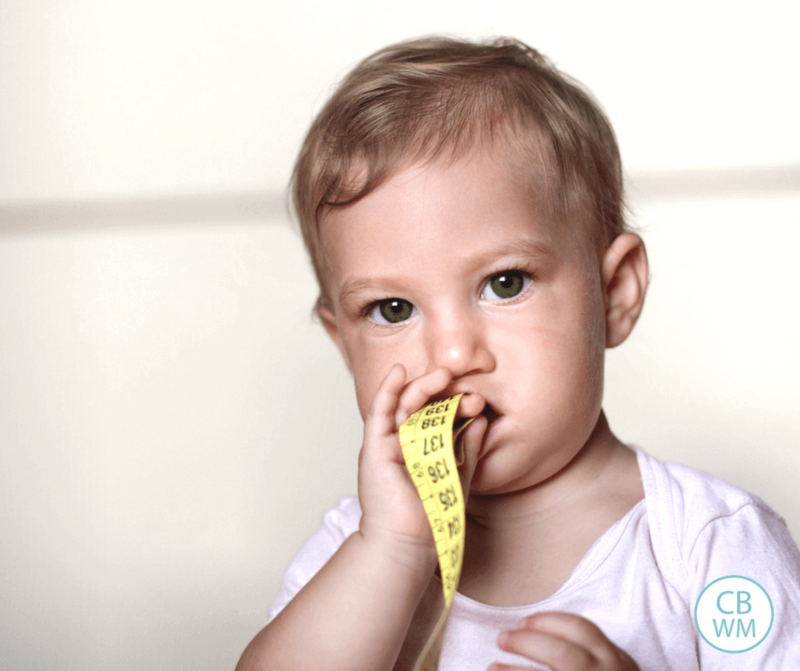 If your baby has been eating well on your 2.5-3 hour schedule then suddenly seems to want to eat all day, there is a good chance it is a growth spurt. Hogg says this lasts a day or two. I want to add, though, that it will only last a day or two if you attend to the growth spurt. If you refuse to feed more often, then the need for calories for the growth is going to take longer to fulfill. Hogg says, if you feed your baby, it will last about 48 hours. Then your baby will go back to the schedule. How often do growth spurts happen? They seem to happen constantly for the first four months. Hogg says they are around every 3-4 weeks. Hogg cautions against confusing a growth spurt with milk supply lessening. Be mindful of that. How does a growth spurt work? Mom starts to produce more milk because she is receiving more stimulation. Your baby will eat more often (or possibly nurse longer periods) to produce more milk. Your body will then produce more milk for baby to drink. If you feed formula, you can increase the amount of formula eaten–that is assuming baby can take in more in one sitting. If not, you will have to add an extra feeding to your day by feeding more often. If your baby is hungrier only at night, then it is most likely not a growth spurt. It is that your baby isn’t getting enough calories in the day. You would then need to add a feeding to your day. Another option would be to pump the extra milk your baby doesn’t drink after the first feeding of the day. Save that milk and give it to your baby at night in a bottle. I love that idea. Does Hogg say what ages the spurts happen around for children a little older. I think our 6 month old may be going through one. She will eat like a horse for a few days and then on others it seems like it is a bother for her to eat. But yesterday she wolfed down a TON of formula AND food. Every time we fed her (4 hour schedule) it was as if she had never eaten. Traveling Turtle (cute), I’ve heard/read that growth spurts happen at 3 weeks, 6 weeks, 3 months and 6 months, so it definitely makes sense if your LO is 6 months. Traveling Turtle, pretty much everyone agrees that there is a growth spurt at 6 months, so that is perfectly normal! First of all, congratulations on the pregnancy Plowmanators! I hope you are feeling well. I have a question about getting back into the schedule after a growth spurt. My 3 1/2 month old hit a growth spurt the beginning of the week. He was waking after 45 min, I let him cry for about 10 min., and then fed him and quickly figured out that’s what was going on. And so the pattern continued. This started Monday, now its Friday, and he’s still waking early. Last week he stretched his feedings out to 3.5 hours and sometimes 4. This morning when he woke early, he was definitely not hungry. I waited until the 3 hour mark to feed him, and he didn’t take a full feeding. I’m not sure what to do. He seems to not be hungry anymore, but hasn’t gone back to taking full naps. Is this common? He’s so fussy in the evening due to lack of rest during the day. He won’t fall asleep to finish his nap in the swing (he doesn’t fall asleep in it period). He’s still sleeping great at night (about 10 hours). My sweet 2 1/2 year old has had a hard time with all the extra attention little guy is getting this week. Sorry, I know that was long. Thanks in advance! a difference. She just acts like she’s “full” even though it doesn’t make sense that she could be? Mainly I’m worried that she is not getting enough or that she has become suddenly averse to this formula. But I would think if it was the latter, she’d be more cranky–and she isn’t. She weighed 12lbs 6oz at her 2 mo. check up so I’m assuming she’s 13lbs+ by now? I just have that “at least 2 ounces for every pound they weigh” rule in my head so if she’s only having 5 feedings, in my mind she needs at least 5 1/2 ounces to be getting “enough.” Is this not a hard and fast rule and/or is this normal after a growth spurt? I am worried something might be wrong even though she doesn’t seem upset. She has also had some “pooping” problems in the past few days so I thought maybe constipation was causing a lack of interest in eating…but the problems have just turned out to be trouble going, and not so much not being able to go at all. And according to the nurse at my pediatrician’s office, her stool looks normal…so maybe she isn’t really that constipated at all…just transitioning to formula poop from breastmilk? (She’s been on formula 100% for about 2 or 3 weeks, I was doing some of BF and formula before… and originally exclusively BF.) Sorry this is so long– any ideas?? Thanks! abbie, I don’t have experience in feeding with a bottle, but I would say she would return to what she was eating before the growth spurt. She sounds like she is eating less. If she is happy and diaper output is normal, I would try to not worry about it. Also, babies grow at their own pace. They don’t steadily grown X number of ounces per week. It seems to be more of a burst, then not much, then burst, etc. When I look at Kaitlyn’s numbers over her life, she had visits where she was in 80% and visits she was less than 20%. She is currently about 60%. Her doctor has never shown concern over it. She has had visits where she was 20% one week, went in the next for whatever reason and had shot up to 50%. I am sure it is easy to stress when you see every ounce your baby is or isn’t taking in. I would try to just watch diaper output, sleep patterns, and disposition and go off of that. my 8 week old seems to have dropped the middle of the night bottle. with that said, she only gets 6 feedings a day instead of 7. should i increase the ounces she is getting for the remaining 6 feedings so she is not essentially “losing” those calories? she drinks 4oz per feeding now. bw book says that when babies drop nighttime feeding they arent losing b/c they make up for it during the day, etc… suggestions? Misha, I was just cleaning up comments on this page and saw your question. I am sorry! I assume you have that all worked out by now? Jenny,They can definitely take more ounces. This can be done in bottlefed baby by increasing ounces. In a breastfed baby, you would need to increase time. However, baby does need to have the capacity to be able to take in more ounces. I think this is why you notice the growth spurts so much in the early months and not so much in the later months. They are able to take in more at a time.At week 16, Babywise says you can have 4-6 liquid feedings. As far as weight and feeding, I do think weight has something to do with it, but so does age. My kids were all born from 6-7 pounds, so my experience is with smaller babies. But the Baby Whisperer discusses weight in conjunction with feedings. But both weight and age need to be taken into account. Jori,I would tend to doubt it was a growth spurt. At that age, taking a full feeding doesn't necessarily mean growth spurt. It is easty to take a full feeding if you haven't eaten for several hours.I would probably start offering finger foods, especially things like cheese in case it is a need for more food. I would check out the post 5-8 Month Sleep Disruptions and "Nighttime sleep issues Revised and Updated" for other ideas on why she would be waking. My daughter is almost six months old – slept through the night since she was 2 months from about 8pm until 6am. All that changed two weeks ago and since that time she has woke up in the middle of the night every night. It's been at various times every night. When she awakes she's very hungry and guzzles 4oz of formula then goes back to sleep so I tend to think it's a growth spurt. She doesn't seem to want to eat as much during the day – starts on the bottle and then pulls the bottle out so I'm having a hard time getting her to eat more during the day. Sometimes she'll only drink 2-4 oz every 3 hours. When I try to move to ever 4 hours, she might drink 6 oz. I think this might be a teething issue (she just cut the bottom two teeth but it seems like she's still teething and has pain from it). I started solids a few weeks ago 1x/day about an hour before her last bottle of the night. She loves solid foods and I haven't had any problem w/ that – she's definately ready for it. I've been having a hard time getting her to eat more than 4 oz during her last bottle some times and even when I get her to eat more than 7oz for her last feeding, she still woke up around 4am. I tried adding another solid feeding during the day but she still isn't drinking enough formula during the day so I don't know if I should continue a second solid feeding or add a third or what?!? She usually takes 2 naps a day, sometimes for 1.5 hours or less (in-home daycare). Sometimes she adds a cat nap to that. How long will this growth spurt continue? Or is it something else? How can I get her to eat more formula during the day especially right before bedtime? Should I add solid feedings? How often and at what times? Keri, if this is still happening, I would say it isn't a growth spurt. In fact, since she wasn't eating more in the day, I would guess it wasn't a growth spurt in the first place. I would suggest you look at the post "5-8 month sleep disruptions" as well as "nighttime sleep issues–revised and updated"You might also want to read the recent post "problem solving tip: what has changed? "Good luck! Good morning, my 9 1/2 week old has been sleeping 5 hour stretches since he was 5 weeks and then at 6 weeks he was doing 6-8 hour stretches. The last couple nights he has been getting up after 3 1/2 hours to feed! Could this be sleep regression or. Growth spurt? I sincerely hope my 6 week old is having a growth spurt. It's hard for me to tell because he shows hardly any signs of this during the day. Still easily taking 1.5-2 hr naps in every cycle after being awake for ~1 hr. I often have to wake him from his nap to feed at the 3 hr mark. So he's sticking to 3 hrs between feedings. However, night time has become a different story for about the past 3 nights. Since he was 2 weeks old he has been sleeping from 10pm to 2-3:30 am and then again until ~ 7 am. We were so thankful to have such a good sleeper!! These past few days, however, he has not been taking a good dream feed (could be the culprit…considering waking him up! ), and has been waking anywhere from 12:15-1:45 and then again from 3:30-4:30. I'm struggling with whether I should feed him or let him CIO. Last night we tried CIO after he woke 1.5 hrs after his first MON feeding…cried off and on for 1.5 hrs (AHHH) so I finally got up and fed him. He was, in fact, hungry = guilty mama. I'm scared to let this go on, fearing it will never end…but want to help him through a growth spurt if this is what it is. Suggestions? What would you do if this lasts more than a few more days? Wanna have a sleeper-through-the-nighter SO bad at 8 weeks…doesn't everyone? But we're digressing instead of lengthening times between feeds. Also, unrelated, and quick question. I've been considering giving a bath before bed every night, but this would require waking him early from that last nap. Wondering if he might sleep better at night if he slept less during day. Hard to decipher if it's worse to have an over-rested baby or an over-tired baby when it comes to STTN. What do you think? just so you have the most up-to-date information whenever you get a chance to respond…I tried waking up for the dream feed by unswaddling. First couple of nights it worked like a charm. He began waking only once again. Then, he went back to waking twice a night for no apparent reason…at 1:30 and 4:30 after a 10:00 df. So we've stopped the df and he now wakes at 12:30-1 and ~5:00 after a 6:30 pm feed and 7:00 bt. Do you think he works better without a df? it seems that he started waking more often with it. I so wish it would work for him so that when he does start sleeping 7-8 hours he would essentially be STTN instead of waking at 3:00! what do you think? I've also begun pumping after morning feed and giving him an extra 1-1.5 oz of milk in addition to breastfeeding at his last feed before bt. First, I am SO grateful for this blog. Thanks for all the time you give Valerie to help other moms on the journey. So my question is do growth spurts continue past the first year? You were saying that they happen every month or so. I have a 14 month old daughter and she in the last few months has become ALL about food. She eats really healthy but has become a little chunk. I normally end up feeding her a lot of food and often decide a meal is over, just because I feel in my gut that it should be. Whenever I eat something or am trying to cook dinner she signs, more, more, more and begins to get really upset if I don't give her food, even if she just ate a FULL meal 5 minutes before. Am I suppose to feed her till she refuses food? Is she in a perpetual growth spurt? I can't even get dinner cooked these days because she cries on the floor while I cook and by the time it's time to feed her dinner she is not in a very good emotional state. I'd so value your thoughts! I also meant to ask one question about my 8 week old daughter. I started a few weeks ago pumping after my first feeding of the day once I get her down to sleep to be able to give the milk to my 14 month old during this cold and flu season. She seems to be in a growth spurt right now and has started getting really fussy during her second feeding. She will nurse some on and off but doesn't take a full feeding. I can't tell if she's still full from her morning feeding or is she not getting enough milk since I just pumped an hour and a half earlier? I thought we were always making milk so I should be ok. She seems to cry more to go down and if I go in and get her to try to feed her more she won't take any more milk. But generally doesn't seem to be able to soothe herself to sleep as well as normal. What do you think?